CHITWAN, March 24: Although the Naryangadh-Muglin Road Upgrading Project (NMRUP) had announced to halt vehicular movement for six hours a day as to expedite the renovation work, the locals are still doubtful whether the snail-paced construction will be completed before the new deadline. As per the agreement, the project which started from April 2015 should have been completed by now. Members of the project blamed the earthquake and blockade for the delay in completion of the project. According to the project officials, only 41 percent of the construction work has been completed by now. Few days ago, the NMRUP published a notice which declared suspension of vehicular movement for six hours a day from 10 am to 4 pm effective from March 28. As the construction is underway, it takes almost three hours to cross the 36-km road instead of the normal one hour before the construction started. As the project was not able to meet the previous deadline, it was given additional eight months to finish the work. The work must be completed by this December, as per the extended deadline. But the workers and even the commuters claim that it is impossible to complete the construction within this new deadline. The construction company and the project have targeted to complete 59 percent of the remaining work within eight months. According to Shiva Khanal, engineer and information officer of the project, the responsibility of the construction has been handed over to various construction companies by dividing the road into three sections. According to the project officials, they have an obligation to complete 50 percent of the total work within a few days by any means. As per the agreement, if the construction companies do not complete half of the work that period they will have to pay compensation. The fear of bearing compensation has increased the pace of work but the workers speculate that the construction will take at least a year to complete. Commuters are compelled to take alternate routes during the period in which the road is closed for construction. 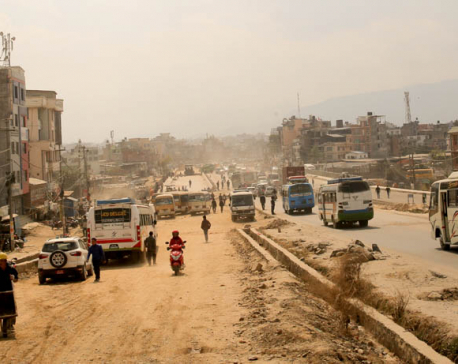 The ongoing construction and the suspension of vehicular movement have affected the daily life of people.